The overburden conveyor bridge is a steel construction with implemented belt-systems. It spans the whole opencast mining area and connects the extraction-side (extraction of overburden) with the side where the overburden was dropped. The F60 served to skim the brown cole, i.e. to seperate it from the overburden (the layers of earth that lie over the layers of coal), so the bridge was not used to actually extract the coal. The steel giant, which weighs 13,500 tons, was able to skim a maximum of 60 metres of overburden. 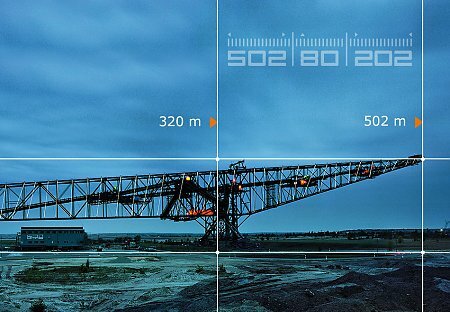 The two excavators were theoretically capable to convey 29,000 cubic metres per hour, which corresponds to a weight of 50,000 tons of overburden. This equals the amount of overburden that would be necessary to fill up a football field up to a height of 8 metres. The maximum annual production capacity of the whole complex was 130 million cubic metres. Because of its size and the similar design, the F60 is also called the „Horizontal Eiffel Tower“. Until 1930, the Parisian landmark, built in 1889, was the largest building in the world. Of course, it beats the F60 with its long lasting history and its over 5 million guests per year, but if one would lie down the Eiffel Tower, the F60 would beat its length. The Eiffel Tower is - with its antenna - 324 metres long. The F60 is 502 metres long and therefore 178 metres longer than the Eiffel Tower. Even today, after the modification and disassembly of some components, the F60 weighs about 11,000 tons. The Parisian steel construction weighs only 3,700 tons. 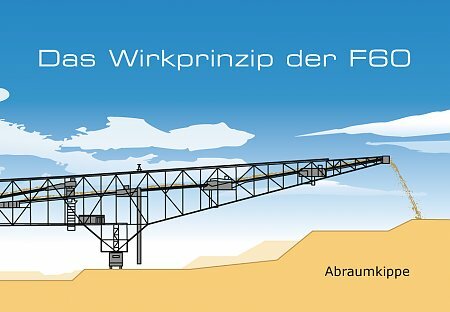 All in all we can say that the steel giant of Lichterfeld, built in TAKRAF Lauchhammer, doesn’t have to shun the comparison with the Eiffel Tower.